The original Black & White seemed to suffer from one major problem: the game became relatively unexciting and rather simple. Fortunately Black & White 2 does not suffer this problem in the slightest. In fact, B&W2 makes some significant improvements over its predecessor by delivering amazing graphics, superior gameplay, and better creature mechanics. These improvements not only add to the excitement of the game, but they also change the face of the game by providing an RTS twist. All of a sudden B&W2 starts looking more like real time strategy and less like a god simulator. The condensed version of the story for B&W2 is that you are a god that has been awakened by the prayers of people who need help with all their problems. You are an inexperienced god and in order to learn the ropes, you are provided with two advisers, one good and one evil. The advisers serve as your mentors but they do not force you to choose between good or evil, that decision is up to you. After some “god training” you select your creature: either a lion, cow, ape or wolf. The game begins as you take control of your people, the Greeks, and start helping them rebuild and regroup from their devastating losses to the evil Aztecs. One of the most important aspects of this game that you should understand is that your decision to be good or evil will influence almost everything around you. This includes even the simple things like the ground or the buildings. For example, if you decide to be evil you will notice that lava and rock start to cover the ground. This is in contrast to the colorful and vibrant life you see when you choose to be good. Don’t get confused though; being evil can have some cool benefits. Probably one of the most noticeable changes is the look of the hand. It becomes scarred, and the nails turn yellow and in general the hand starts to look pretty sinister. However, even this aspect has an RTS twist because your choice to be good or evil will directly impact how you can conquer other towns. Your choice to be good will give you the option of building your town’s impressiveness to a point where the enemy townspeople are persuaded to actually migrate to your town. You can conquer a town simply by choosing to be good and building an impressive town. Of course your other option is to take the town by force and attack the town with your army. You make the decision, good or evil, and almost everything in the game changes as a result. The creature is always a focus when discussing B&W. Training your creature remains a primary objective a B&W2. Fortunately, the creature mechanics in the original Black & White seem rudimentary in comparison to what Lionhead has cooked up for B&W2. Instead of having a creature that is difficult to train and provides little to no feedback, you have a creature that you can interact with in many different ways and train quickly. 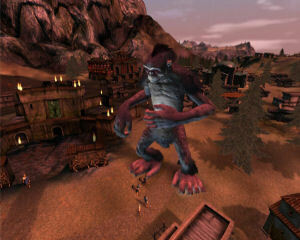 Lionhead added some great aspects to creature mechanics by making significant changes like allowing you to view the creature’s thoughts during gameplay. This might seem trivial, but by watching your creature’s thoughts you can respond to them appropriately and quickly train the creature in certain behavior. For example, the creature may decide it’s going to eat a villager (or do any number of other things to a villager…) and you can quickly choose to be either good or evil by either stopping the creature or allowing the creature eat the villager and then petting him and providing positive reinforcement. When you provide the positive reinforcement the creature learns that their behavior is good. All of a sudden your creature will basically change from “rarely eating a villager” to “always eating villagers”. Thinking of this from an RTS perspective, you can quickly teach your creature to work out and train him and essentially increase his effectiveness on the battlefield.